Although the hotel is already an old building, the rooms did not smell that way. Beddings and towels also smelled clean. 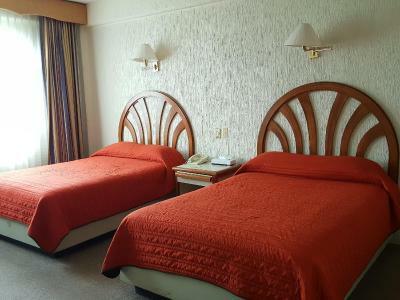 The location of the hotel is also great, as there are a lot of business around, small restaurants, a convenience store, a park, Starbucks, movie houses, etc. It also has its own parking space. La ubicación céntrica en la ciudad, precio y comodidades. Un establecimiento que cumple con lo que vale, y en una zona céntrica y con muchos lugares para comer a pasos. Cama muy cómoda. Sistema de ventilación perfecto y la limpieza muy bien. Casa Real Zacatecas This rating is a reflection of how the property compares to the industry standard when it comes to price, facilities and services available. It's based on a self-evaluation by the property. Use this rating to help choose your stay! Offering a restaurant, Casa Real Zacatecas is located in Zacatecas. Located 5 mi from the city center, it features an on-site bar, free WiFi and 24-hour reception. 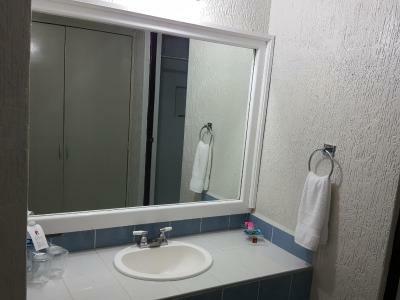 Each room here will provide you with a cable TV, a desk and a private bathroom with free toiletries. They also include a fan. The restaurant at Casa Real Zacatecas serves national and international cuisine, and other options can be found within 1,650 feet. Meeting and banquet facilities are also available. Bernandez Golf Course is a 5-minute drive from the property, while Zacatecas International Airport is 19 mi away. When would you like to stay at Casa Real Zacatecas? House Rules Casa Real Zacatecas takes special requests – add in the next step! Casa Real Zacatecas accepts these cards and reserves the right to temporarily hold an amount prior to arrival. It says that the rooms have fans only, but I got a room that only had a fan from a central cooling system and was not enough. Also one side of the hotel gets really hot in the afternoon as the sun's rays enter the room directly (we went in March). Fortunately, the hotel gave us a stand-fan. The other room that we had (we booked two rooms) had a ceiling fan and was also on the other side of the building and was a lot cooler. The cable TV was not clear (all channels were grainy).